Again we are entertained by the joys of collecting and the discipline of scholarship. No matter the object, there will always be someone who, because of deep emotional and æsthetic attachments, will spend the time, expend the energy, to collate and document all extant information of the apple of his or her eye. In this case: ukuleles. But not all ukuleles, only those made by C.F. Martin and Company of Nazareth, Pennsylvania. And why not? These are beautiful instruments, well-regarded, and this particular manufacturing company is shown, throughout the years, to be honest and taking justifiable pride in what they do. 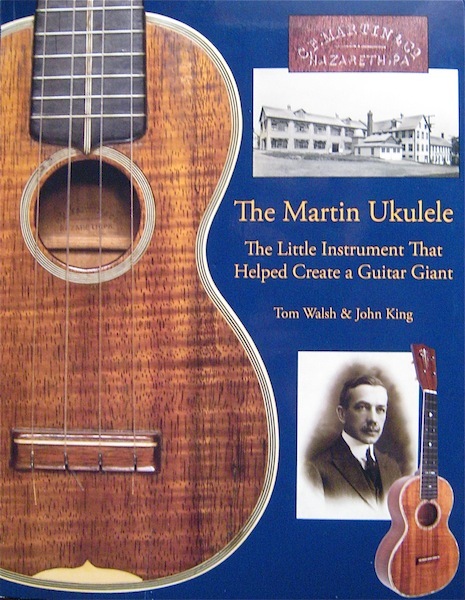 Martin is best known today for their guitars, but we find upon reading this book that it was the popularity of the ukulele that had sustained the company throughout the 1920s, insuring the company’s survival and growth. In his preface, Tom Walsh tells of how his interest started with one classic Martin ukulele that his sister had found in the trash and given to him, how he acquired another, then this one, then that one, and finally how he, along with John King, felt compelled to tell the history. Both Walsh and King became experts in their hobby, both deeply involved in the Ukulele Hall of Fame Museum in Cranston, Rhode Island, whose mission is “to document, preserve and promote the history of the ukulele, its players, and makers, as well as to inspire and engage people everywhere in the perpetuation of the ukulele and ukulele music through performances and exhibits.” The preface also delivers solemn news. While Walsh was busying himself in “tabulating ukulele production totals,” he received word that King had died suddenly of a heart attack. King at that point had written the first chapter, and, I assume, already had immersed himself in the research. Disheartened but not without courage, Walsh, with the assistance of his beloved wife Nuni, whom he had met at a Ukulele Expo, eventually, after some years of toil, completed the book. You can quite imagine the ocean of hard detective work involved in such a project, even when the target company, as it is in this case, freely opens its archives and offers complete cooperation and support. 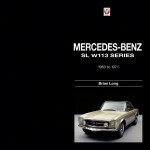 This is evidenced by the book’s many charts, illustrations, and appendices that elaborate model differentiations, specifications, and production figures, and Ukulele, handsomely and generously illustrated, reproduces memos, order sheets, and corporate letters, many reaching far back through the company’s history. Minutes from board meetings and the company’s annual reports are used to illuminate and instruct. Walsh tells us how company founder Christian Frederich Martin learned his trade in Vienna, moved his family to New York City, opened a music store there, eventually settled in Nazareth, and there, in 1867, officially opened the concern of C.F. Martin & Co.—and the history of both the Martin family and their business is told from that point up through to the present. 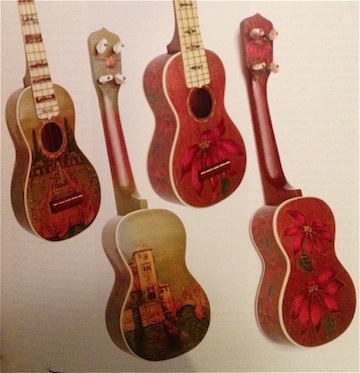 The author also records the evolution of the ukulele, from Madeira to Hawaii to the Mainland to the world, from the rajào and machete (the stringed instrument, not a blade) to the ukulele that we know today. We learn of the rise in popularity of the uke, originally from America’s embrace of Hawaiian music in the late ‘teens to the earlier 1920s, to its use in Vaudeville; and we all have seen images of Big Men on Campus with their raccoon coats, argyle sweaters, boaters and a ukulele in hand to serenade their sweethearts. During the years of the Great Depression, sales declined, and eventually the overwhelming popularity of rock-n-roll created a demand for the guitar, leaving its smaller sibling behind. In 1946 Martin manufactured 2,950 soprano ukuleles; in 1994 this figure drops to 26. This is a representative example, and dramatically shows the downward trend. Martin halted ukulele production in 1994, and it wasn’t until 2005 that it was revived. 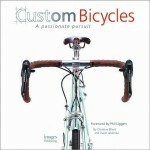 This book tells the whole story. And, because of the nature of a book of this sort, a book that is as much a reference as it is an entertainment, the story is told in great detail. Curious about the variety and composition of tuning pegs Martin used throughout their ukulele production? Did you know that in 1922, on their Style 2 model, Martin replaced the friction tuners, using Grover patent tuners with white buttons in their stead? Or that in 1920 and 1921, on the Style 1K, “the fret markers positions changed from frets five, seven, and nine to five, seven and ten.” Would you like to know more than you do now about Johnie Dunn, Ukulele Ike, Viola Mott, and Singhi Breen? If I seem a bit facetious here, it does not mean that I do not appreciate that such minutia is welcome. As I said, Ukulele, besides being an attractive volume, is a resource. Hobbyists as well as musicians, curators, buyers, sellers, and owners of Martin instruments, would indeed like to know when various materials and accoutrements were used or changed. And the book is attractive. The reproductions of documents, tables, graphs, manufacturing paper patterns, LP album covers, and the photographs, many archival, of people, craftsmen, musicians, business folk, and the ukuleles themselves, are arranged with grace and a practiced eye. The images, whether shown for æsthetic or illustrative purposes, are clearly reproduced and neatly balanced with the text. Also, the history is told by an author with a strong command of the language as well as a talent for telling a tale plainly without sacrificing interest. I found a few typos, but hardly enough to disturb. Did I read every page of specifications for every taropatch (look it up) and ukulele listed? Was I sometimes lost in the book’s esoterica? No and yes, but that doesn’t stop me from giving The Martin Ukulele a ringing recommendation. Aloha.